Writer’s Workspace: 4/8 – Comedy or Tragedy? What I’m working on: Now that I’ve FINALLY finished Blood Red Sun and sent it off to Angry Robot, I’m diving back into my next novel, Absent. I’m about 1/3 of the way in to the first draft and the characters have just traveled through time to the excavations at Ur, Iraq in the 1930’s. In my mug: Lately I’m obsessed with Numi tea. Today I’ve got their Aged Early Grey steeping in my cup. Keeping me company: Since I’ve revamped my office with a new desk and ergonomic chair, Mr. Ramses has inherited my old office chair. 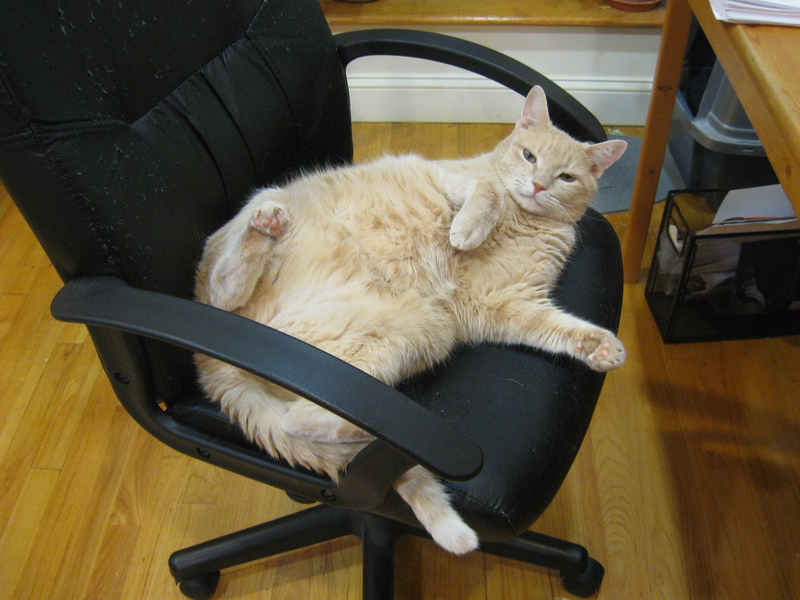 Regular readers will know that he and I have long competed over access to that chair. Needless to say, he is pleased with what he perceives as a thrilling triumph of good over evil. On the iTunes: I put the collection on shuffle and it offered up “Try a Little Tenderness” by good old Otis. I’ll take that. Out the window: I can’t talk about it, I just can’t. I know a lot of us are wondering where the hell spring is. All I can say is: it ain’t here. We do, however, have plenty of April showers. A little procrastination never hurt anyone: Writing Excuses has a podcast up that’s all about the romance, Catherine Schaff-Stump is working on a series of posts addressing things she wished she’d known when she first started writing, and John Favreau defends his latest offering, Cowboys and Aliens. Okey-dokey people, that’s all from here. What are YOU up to today?